Several political bigwigs in Haryana were among the 108 candidates who filed their nomination papers for the forthcoming Assembly elections on the occasion of Makar Sankranti today, which is considered an auspicious day by some. Mr Shiv Raj Singh Chauhan, national General Secretary of the BJP and in charge of the party affairs in Haryana, has asserted that a peep into the list of candidates released last night by the Congress showed that it had made the Haryana unit of the party a “family limited company”. He made this observation while addressing a press conference here today. There is at least one thing common in the Congress and the BJP. Both have given the ticket to at least one candidate each, who has been indicted by the CBI. The BJP candidate as well as the Congress nominee, interestingly, figure in the same case which was investigated by the CBI. Expressing anguish over the denial of the Congress ticket to him from the Sonepat Assembly constituency, the sitting MLA, Mr Dev Raj Dewan, today chided the Congress leadership for playing a game of fraud with the six MLAs who joined the Congress six months ago following assurance from the party high command that they would be given the party ticket for Assembly elections. Five candidates including a Haryana Minister, filed nomination papers in Ambala district today. The nomination papers were filed by Haryana minister and INLD candidate from Mullana (reserved) seat Risal Singh, BJP candidate from Mullana Arun Kumar, BJP candidate from Naggal, Mr Pavitar Singh Bajwa, BJP candidate from Ambala Cantonment, Mr Ravi Sehgal and Rashtriya Loktantrik Party candidate from Ambala Cantonment Mr Naresh Kumar. Bharatiya Janata Party (BJP) candidate from Kalka Assembly segment, Sham Lal Bansal, today filed nomination for the Vidhan Sabha elections. He also declared assets own by him and his family worth over Rs 2.92 crore. A mahapanchayat of dissident BJP activists today decided to field Master Shiv Prasad as rebel BJP candidate from the city Assembly constituency. The decision was unanimously taken by the mahapanchayat convened at Nauharia Dharamsala this afternoon. Master Shiv Prasad had been an MLA from the city for the past three terms. Soldiers displayed their skills at an exhibition organised at Mahavir Stadium here today. The four-day-long exhibition commenced on January 12 and will go on till January 15, Army Day. Major-Gen R.K. Loomba, General Officer Commanding 33 Armoured Division, said the exhibition was open for all civilians. 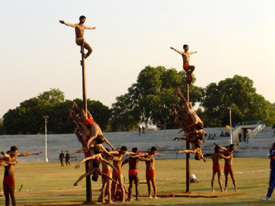 Soldiers display skills at an exhibition at Mahavir Stadium in Hisar on Friday. A newly married woman reportedly committed suicide by burning herself due to harassment meted out by her husband’s family in Bahadurgarh. The police registered a case of dowry death against the husband and the in-laws today. Mr Justice M.M. Aggarwal of the Punjab and Haryana High Court today dismissed the petition filed by Haryana MLA Karan Singh Dalal for providing more security cover to him in view of threat to life faced by him. Some armed persons kidnapped a local lawyer from his residence last evening. The lawyer was to get married on Monday. Local lawyers suspended work in the afternoon today. The lawyers have demanded immediate arrest of the accused. The police has arrested Satya Devi, mother-in-law of Usha Sanchalika of Maharshi Dayanand Paramedical Institute who was allegedly poisoned to death by her husband Pradeep and other members of the in-laws’ family in their house in Adarsh Nagar here on the night of January 6. Former Haryana Public Works Department Minister Dharamvir and two others have been acquitted in a case of graft, by a local court today. Mr Dharamvir was a minister in the Bansi Lal government. 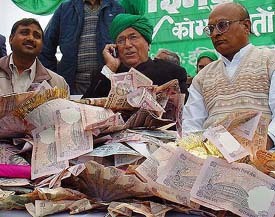 Chief Minister Om Prakash Chautala, former Chief Minister Bhajan Lal, leader of BJP legislature party Krishan Pal Gujjar, fireband MLA Karan Singh Dalal, Finance Minister Sampat Singh and officiating leader of the Congress legislature party Ajay Singh were among the prominent political figures who filed their papers today. This has raised the total number of nominations filed so far to 183, which includes 14 women candidates. Kalka — Sham Pal (BJP); Sadhaura — Balkar Singh (Independent); Chhachhrauli — Akram Khan and Samim Khan (INLD); Yamunanagar — Surya Parkash (Independent); Mullana — Rishal Singh and Rajbir Singh (INLD) and Arun Kumar (BJP); Ambala Cantt — Naresh Kumar (National Lok Tantaric Party) and Ravinder Kumar of BJP filed four sets of nomination papers; Naggal — Pavitar Singh Bajwa (BJP); Indri — Rajpal and Neelam (Independents); Jundla —Susheel (Independent); Rishal Singh (Ekta Shakta Party); Assandh — Om Parkash and Ram Pyari (Ekta Shakti Party); Sube Singh (CPI) and Rajinder (BJP); Panipat — Kasturi Lal Ahuja and Suresh Mittal (INLD) and Om Parkash Jain (Independent); Shahbad — Ramesh Kumar and Sher Singh (BSP) and Bhupinder Singh and Shingara Singh (Ekta Shakti Party); Radaur — Ishwar Singh (INLD); Thanesar — Karam Singh and Gobind Ram (Independents) and Harpal Singh Kashyap (BSP); Pehowa — Balwinder (Independent); Gulha — Chamel Singh (Ekta Shakti Party); Pundri — Randhir Singh (BJP); Meham — Rohtas (Rastriya Lok Dal ); Beri — Santosh Devi (BJP), Anup Singh (BSP) and Suresh (Independent); Salhawas — Kartar (Independent); Gohana—Kedar Singh (JD Secular), Satya Narain (Ekta Shakti Party); Sonepat — Lalit (BJP) and Satinder (INLD); Rai — Mehar Singh and Jai Bhagwan (Independents), Dalel (JD Secular); Rohat — Sukhbir Singh (NCP); Narwana — Om Prakash Chautala (INLD); Uchana Kalan — Virender Singh (INC); Rajaund — Satvinder Singh (INC), Pooja Sharma (BJP); Jind — Mange Ram Gupta (INC), Mahavir Gupta(Independent), Surinder Singh(INLD); Jullana — Pratap Singh Lathar (INLD) and Hari Om (Janta Dal Secular); Mewla Maharajpur — Krishan Pal Gujjar (BJP); Ballabgarh — Narain Prasad (CPI—M) and Hari Prasad (Independent); Palwal — Karan Singh Dalal (INC); Hathin — Rattan Singh Sorot (Rashtriya Lok Dal); Ferozepur Jhirka — Bhani Ram Mangla(BJP); Toaru — Nihal Singh (BSP); Sohna — Permanand (Independent), Gurgaon — Rakesh Kumar Bhardwaj, Tejpal, Ratan Singh, Vimal Prakash and Satish Maratha (Independents), Subhash (CPI); Bhadra — Ranbir (INLD), Dalvir Singh and Neki Ram (Independents); Dadri — Vijay Prakash (INLD); Mundal Khurd — Ram Kishan (Independents) and Om Prakash (BJP); Bhiwani — Vasudev (INLD); Tosham — Sunil Kumar (INLD); Loharu — Jaibir Singh and Parmod Kumar (Independents); Barwala — Umed Singh Lohan (INLD); Narnaund — Labh Singh (Rastriya Lok Dal); Hansi — Amir Chand (INC); Bhattu Kalan — Ranjit Singh, Sampat Singh and Krishna (INLD), Daya Nand (BJP); Hisar — Hari Singh (Independent); Gherai — Puran Singh (INLD), Kamlesh (Independent); Tohana — Fateh Singhaka Sheregill (Independent), Sampuran Singh (CPI); Adampur— Bhajan Lal and Ramji Lal (INC), Hawa Singh (Independent); Darba Kalan — Ram Kumar (SP); Sirsa — Sri Niwas (BJP), Atam Prakash (Independent), Ganpat Ram (CPI); Rori — Renu (BJP); Rewari — Captain Ajay Singh and Shakuntla (INC); Jattusana — Jagdish Yadav (INLD) and Balbir Singh (BSP); Mahendargarh — Sadhu Ram (Rashtriya Lok Dal); Ateli — Ved Parkash (BSP); Narnaul — Radhey Shyam (Independent), Pat Ram (BJP) and Babru Bhan (INLD). Mr Shiv Raj Singh Chauhan, national General Secretary of the BJP and in charge of the party affairs in Haryana, has asserted that a peep into the list of candidates released last night by the Congress showed that it had made the Haryana unit of the party a “family limited company”. He made this observation while addressing a press conference here today. Dilating upon the list of Congress candidates, he explained that both Mr Bhajan Lal and his son Chander Mohan as well as his nephew Dura Ram had been nominated from Adampur, Kalka and Fatehabad while Mr Shamsher Singh Surjewala and his son Mr Randeep Singh Surjewala had been nominated from Kaithal and Narwana. Similarly the entry of Mr Ranbir Singh Mahendra and Mr Surender Singh, both sons of Mr Bansi Lal, as well as Mr Somvir Singh, son-in-law of Mr Bansi Lal, have been facilitated from Mundhal Khurd, Tosham and Loharu. Also Mr O.P. Jindal, father of Mr Navin Jindal, MP, and Mr Yadvinder Singh, younger brother of the Union Minister of State for External Affairs, Mr Rao Inderjit Singh, had been nominated from Hisar and Jatusana, he added. Besides, Mr Bhajan Lal’s younger son Kuldeep Bishnoi was already an MP from Bhiwani. He remarked that the prices of essential commodities had soared because of the anti-poor and pro-rich policies of the Congress-led UPA government during the past seven months making life miserable for the masses. He flayed the Congress alleging that it had betrayed the people of Haryana by its apologetic approach towards the Water Agreements Termination Act passed by the Capt Amarinder Singh government of Punjab. Mr Chauhan said all these issues would be on the top agenda of the BJP in the Haryana Assembly elections. He stated that the BJP would not enter into any post-election alliance with the INLD. If the BJP has nominated a former Haryana Minister, Mr Kartar Singh Bhadana, from Sohna, the Congress has given the ticket to a close relative of his, Mr Ram Kishan, from Naraingarh. The names of both figure in the chargesheet filed by the CBI in the infamous illegal mining case investigated by the bureau on the directions of the Punjab and Haryana High Court. The chargesheet was filed by the CBI in the court of the Special Judge, Ambala, Mr M.M. Sharma, last year. Mr Bhadana, who was named by the CBI as an accused, is currently on bail in that case. Mr Ram Kishan’s name figured in the FIR lodged by the CBI as a partner of Messrs Ram Kishan Purni Devi. In the chargesheet no criminal offence was made out against him. However, the CBI found him responsible for causing an estimated loss over Rs 30.38 crore due to illegal mining in Ankhir village of Faridabad district. In the charge-sheet, the CBI wrote that during investigation of the case, a technical team from the Indian School of Mines, Dhanbad, assessed the quantum of loss of ordinary sand in the Ishq Mandi area of Faridabad district to be about 38.70 lakh tonnes dur to illegal mining. The loss of silica sand was assessed to be over 6.66 lakh tonnes during the period between July 17, 1989, to April 16, 2002. The CBI said that after taking into account the royalty, sales tax and cost of ordinary sand and silica sand, the estimated loss to the state government came to over Rs 76.65 crore. Out of this, the CBI alleged, Mr Ram Kishan caused a loss of over Rs 30.38 crore, while the loss of over Rs 45.74 crore was attributed to Mr Bhadana. The CBI also recommended to the Haryana Mines and Geology Department to initiate proceedings under Section 21(5) of the Mines and Minerals (Development and Regulation) Act, 1957, against Mr Ram Kishan. For reasons, best known to it, the department is still to initiate action against Mr Ram Kishan, the Congress nominee from Naraingarh. Meanwhile, those who filed nominations today were INLD candidate Satinder Kumar Nandal and BJP candidate Lalit Batra from the Sonepat Assembly constituency and Sukhbir Farmana of the NCP from the Rohat constituency. After filing nomination papers, Mr Risal Singh said that he had worked hard for the people of Mullana. “I have brought all round development in Mullana during my tenure, he said. BJP candidate from Mullana Arun Kumar also filed papers today. Assets of Haryana minister Risal Singh include 85 kanals of agricultural land, cash in bank Rs 51,000, 1995 model Gypsy valued at Rs 1 lakh, and a deposit in Samta Motors for advance booking of car for Rs 7 lakh. 31.8 grams of gold, Kisan Vikas Patra of Rs 10,000 and a monthly pension of Rs 7,773. He has taken Rs 7.27 lakh loan for house and Rs 5.82 lakh for car. Assets of BJP candidate from Ambala Cantt Mr Ravi Sehgal include cash Rs 25,000, cash of wife Rs 25,000, cash of son Rs 15,000 and cash of daughter Rs 2,000. Cash in bank Rs 425, an LIC policy of Rs 1 lakh in son’s name, two trucks, one Esteem car, 10 tolas of gold and a Rs 7 lakh house in the name of wife. Assets of BJP candidate from Naggal Mr Pavitar Singh Bajwa include cash Rs 1.50 lakh, bank deposit of Rs 31.13 lakh, 40 grams of gold and 12.5 acres of land valued at Rs 54 lakh. A share of Rs 4 lakh in ancestral house. Assets of BJP candidate from Mullana (reserved) seat Mr Arun Kumar include cash Rs 15,000, cash of wife Rs 5,000, bank deposits Rs 44,816, joint FD Rs 5,000, another FD of Rs 5,000, LIC policy of Rs 6.60 lakh, LIC policy of daughter of Rs 1 lakh, 50 gram gold, 250 gram gold of wife and 20 gram gold of daughter and a house in Jagadhari on 500 square yards. Bharatiya Janata Party (BJP) candidate from Kalka Assembly segment, Sham Lal Bansal, today filed nomination for the Vidhan Sabha elections. He also declared assets own by him and his family worth over Rs 2.92 crore. The declaration of assets, attached with the nomination form of Mr Bansal, also shows that he has taken bank loan Rs 5.96 lakh, and has four insurance policies worth Rs 4.12 lakh. Mr Bansal and his family have Rs 1,53,500 cash at home, and Rs 4,17,518 in various bank accounts. His wife has 397.500 gms of gold (valued at Rs 2.80 lakh). His family owns two cars worth Rs 9.95 lakh, besides over eight bighas and 13 biswas of agricultural land (valued at Rs 20 lakh). Over 65 kanals of land (worth Rs 23.50 lakh) is in his son’s name, while a one kanal house (Rs 90 lakh), seven marla land (Rs 35 lakh), and an SCF ( Rs 85 lakh). Mr Bansal came to the office of Returning Officer, Verender Dahiya, in a procession. Earlier, a cavalcade of vehicles went about various parts of the township, and sought votes in favour of Mr Bansal. He was accompanied by district president of BJP, Mr B.K. Nayar, State Treasurer, Mr Gian Chand Gupta, Councillors, Mr V.K. Sood and Mr C.B. Goel, and other senior party leaders. He filed in nomination at 12.15 p.m. Those who proposed Mr Bansal’s candidature were Mr B.K. Nayar, Mr V.K. Sood, Ms Rekha Sharma, and Mr Rohtas Kumar. Congress candidate Chander Mohan will file nomination papers tomorrow. The BJP candidate, Ms Veena Chibber, and a former MP, Mr Ratan Lal Kataria tried hard to placate dissidents. Ms Chibber and Mr Kataria even went to the meeting to urge dissidents to toe the party line but to no avail. The dissidents were determined to field the rebel candidate. As a matter of fact, the arrival of Ms Chibber followed by Mr Kataria was unexpected and it took dissidents by surprise. Ms Chibber told dissidents that she had worked hard for the party as well as for the city and even if some people were feeling slighted, she was ready to apologise. However, her words failed to make any dent in the rebellious attitude of dissidents. Faqir Chand Aggarwal, withdrew in favour of Master Shiv Prasad. Mr Aggarwal said he is extending support to Master Shiv Prasad on the condition that if he wins, then Master Shiv Prasad must support the BJP. While dissidents said their decision was final, Mr Kataria said he was still hopeful of clearing the impasse. “We went to the dissidents meeting and told them that party is more important than workers. We informed them that the candidature of Ms Veena Chibber is the decision of the Parliamentary Board and workers must follow the party,” he added. Mr Kataria said we would continue to be in touch with them so that a solution could be found. “Hopefully, within next two to three days, the situation will normalise,” he added. Soldiers displayed their skills at an exhibition organised at Mahavir Stadium here today. The four-day-long exhibition commenced on January 12 and will go on till January 15, Army Day. Major-Gen R.K. Loomba, General Officer Commanding 33 Armoured Division, said the exhibition was open for all civilians. He asserted that the programme was aimed at providing a platform for greater Army-public interaction, besides motivating the youth to join the Army. Apart from highlighting the might of the armed forces in the form of equipment display, the exhibition also included a band display, malkhambh display and a dog show. The viewers present on the occasion appreciated the skills and coordination of Army personnel. An exhibition of sophisticated military equipment is also being held for the public. The equipment on display include T-72 tanks, BMP-2 armoured rifles, AM-50 folding and self-launching bridges, 55-mm Bofors guns, apart from self-propelled guns and several other arms. Besides, a daily light-and-sound show is part of the special exhibition. During the show, various episodes of the 1971 Bangladesh war, including the Battle of Sylhet, are being reproduced before the audience. The exhibition will culminate on January 15, which is celebrated as Army Day in the country to commemorate the taking over of reins by the first native Chief of the Indian Army, General K.M.Carriappa, who later became Field Marshal. Talking to newspersons, General Loomba underlined the role of the Army in ensuring the security of the country’s borders as well as internal security. He laid special emphasis on the crucial role played by the Army personnel in the event of natural calamities and disasters like the tsunami tragedy. He maintained that the division had adopted several villages in Haryana and was working for their development. They had also been conducting rallies for the benefit of ex-servicemen and war widows. General Loomba observed that the NCC played a key role in attracting the youth towards the Army. Asserting that the Army provided an excellent career opportunity, he exhorted the youth to come forward and join the defence forces. A newly married woman reportedly committed suicide by burning herself due to harassment meted out by her husband’s family in Bahadurgarh. The police registered a case of dowry death against the husband and the in-laws today. The accused have not been arrested so far. In his petition, Mr Dalal, who is now set to contest the forthcoming Haryana Assembly elections, had prayed that directions be issued to make some Central government agency such as CRPF or CISF responsible for his security. He had also claimed that in view of his well known differences with the ruling party in Haryana and the ensuing elections, he could be safeguarded only by Central security force personnel. However, his contentions did not find favour with the Bench, which dismissed his petition. According to reports, some armed persons went to the residence of a local lawyer, Mr Sudhir Garhwal, at Bhodia Khera, village, near here, last evening and kidnapped him at gunpoint. It is learnt that the lawyer was getting married on Monday. The lawyer was engaged to a Ding village girl. But later his parents broke that engagement and decided to tie his nuptial knot with another girl. The parents of the lawyer have lodged a complaint against the kin of the Ding girl. The police has registered a case under Sections 452, 323, 364, 506, 148 and 149 of the IPC. The kidnappers, according to sources, have conveyed to the parents of the advocate to either bring the lawyer’s barat to their Ding residence or be prepared for the worst. According to a report, the police has already arrested Pradeep in this connection and launched hunt to apprehend the remaining accused involved in the case. Former Haryana Public Works Department Minister Dharamvir and two others have been acquitted in a case of graft, by a local court today. Mr Dharamvir was a minister in the Bansi Lal government. The Additional District and Sessions Judge, Mrs Sneh Prashar also acquitted the other accused. Sub Divisional Officer, PWD, N.K. Garg and Junior Engineer Surjit Singh Punia. An FIR was registered against the three on October 16, 1998, on the complaint of Mr Gautam Sethi, a partner of the SV Constructions. He had alleged that the SDO and the JE had demanded bribe from him, on behalf of the minister.